Quantity: An average of 21 pounds (without tops) is needed per canner load of 7 quarts; an average of 13-1/2 pounds is needed per canner load of 9 pints. A bushel (without tops) weighs 52 pounds and yields 15 to 20 quarts--an average of 3 pounds per quart. Quality: Beets with a diameter of 1 to 2 inches are preferred for whole packs. Beets larger than 3 inches in diameter are often fibrous. 2. Trim off beet tops, leaving an inch of stem and roots to reduce bleeding of color. Scrub well. 3. Cover with boiling water. Boil until skins slip off easily; about 15 to 25 minutes depending on size. Cool, remove skins, and trim off stems and roots. 4. Leave baby beets whole. Cut medium or large beets into 1/2-inch cubes or slices. Halve or quarter very large slices. 5. Add 1 teaspoon of salt per quart to the jar, if desired. 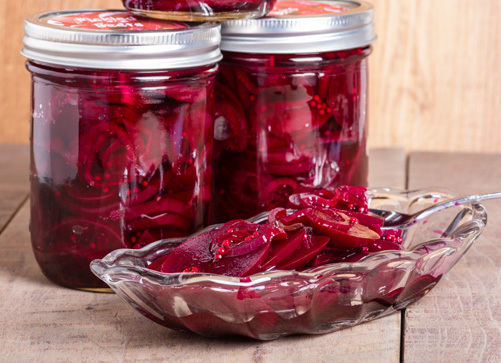 Fill jars with hot beets and fresh hot water, leaving 1-inch headspace.